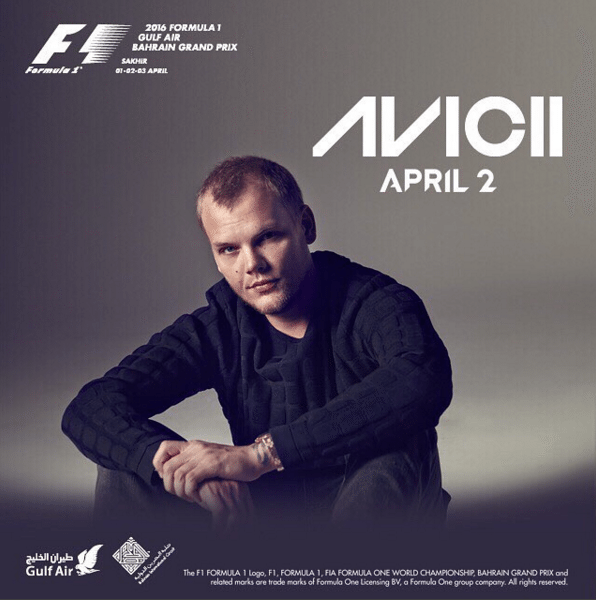 Avicii will be the headline artist at this year’s Formula 1 Gulf Air Bahrain Grand Prix. Global megastar Avicii to headline star-studded line-up of world-class artists. BIC is proud to announce that global megastar Avicii will be the headline artist at this year’s Formula 1 Gulf Air Bahrain Grand Prix. Avicii joins a star-studded line-up of entertainers that includes superstar DJs Axwell Λ Ingrosso and reggae royalty Jimmy Cliff. Al Mahdy commented: “We at BIC are absolutely delighted to have added an artist of Avicii’s calibre to our line-up of entertainers at this year’s Bahrain Grand Prix. “He is truly an international star; a household name that resonates with all music lovers today. “You know you have reached a certain level of greatness and popularity when you can be identified in your industry by just one name: in F1, there is Senna, Schumacher, Vettel; in football, we have Pele, Ronaldo, Messi; in golf, there is Tiger; and in dance music, there is Avicii. “We are already very pleased that superstar DJs Axwell Λ Ingrosso and reggae legend Jimmy Cliff will be with us here at BIC. “We are also delighted to be hosting our first-ever Thursday night concert. We are set to announce in the coming days a regional superstar who is set to perform, and we look forward to revealing more on that shortly. Following our first-ever Thursday night (March 31) concert, internationally renowned reggae legend Jimmy Cliff will be the opening act on Friday, April 1. Cliff will hit the stage directly after F1 Practice Two. His show will be followed by electronic dance duo Axwell Λ Ingrosso. The outset of 2016 saw the duo release instrumental single ”Dream Bigger”, having ended 2015 with Billboard’s #1 dance track of the year courtesy of hit single ”Something New”. That paves the way for Avicii’s live performance on the evening of April 2, the Saturday of the race weekend, straight after F1 Qualifying. Avicii is a twice Grammy-nominated star artist and producer, who has enjoyed a number of hits across the world with tracks such as “Wake Me Up” and “Hey Brother”. He has consistently been ranked as one of the top ten DJs in the world, according to DJ Magazine, and has won strings of awards including two MTV Music Awards, two World Music Awards and one Billboard Music Award, as well as being nominated for two Grammys. Avicii has released two globally acclaimed albums to date, both of which have topped the charts around the world. His most notable work includes four-time platinum track “Wake Me Up,” which hit number one in 81 countries and became the most streamed song of all time on Spotify (over 300 million plays) and the number one most Shazamed song worldwide, while racking up 2.6 billion international streams and 600 million combined YouTube views. His new single “Broken Arrows”, from his most recent album “Stories”, has achieved sales of more than 1.5 million since its release late last year. This year’s line-up of artists continues BIC’s tradition of signing only the world’s best to be a part of an all-encompassing entertainment package at the annual F1 extravaganza.